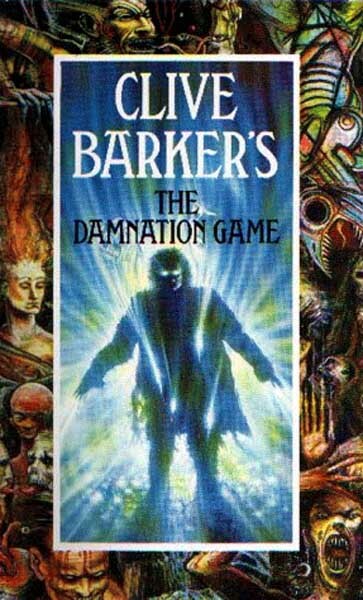 Over time, Clive Barker’s work would come to focus more and more on fantasy and less on horror, but this debut novel of his leans fairly hard on the horror side of that equation, though some of the supernatural manifestations are sufficiently tripped-out as to border on fantasy. The Damnation Game‘s maybe-hero is Marty Strauss, whose gambling habit has resulted in massive debts to dubious underworld figures. We catch up with Strauss in Wandsworth prison, where he is serving his sentence for an armed robbery gone wrong he got involved in as a desperate bid to wipe clear his gambling debts. With his wife clearly growing apart from him and years left to go on his sentence, he’s disinclined to think about the future, but that changes when the mysterious Joseph Whitehead, the obscenely wealthy and powerful head of a major multinational corporation, exerts his influence to get Strauss paroled so that he can work as Whitehead’s bodyguard. Grateful but puzzled as to why he was chosen, Strauss has no idea that Whitehead has very good reason to be scared – he’s been able to live the life he’s lived and indulge the vices he’s indulged thanks to his past association with Mamoulian, a Mephistophelian gambler with power over life and death itself. Mamoulian, for his part, feels his death approaching and insists on Whitehead following through on their mutual understanding – exactly how mutual this understanding was is never clear – that when Mamoulian goes, Whitehead will accompany him into death. With both Whitehead’s psychic daughter Carys and Marty himself as wild cards, the novel chronicles the devastating endgame between Mamoulian and Whitehead.